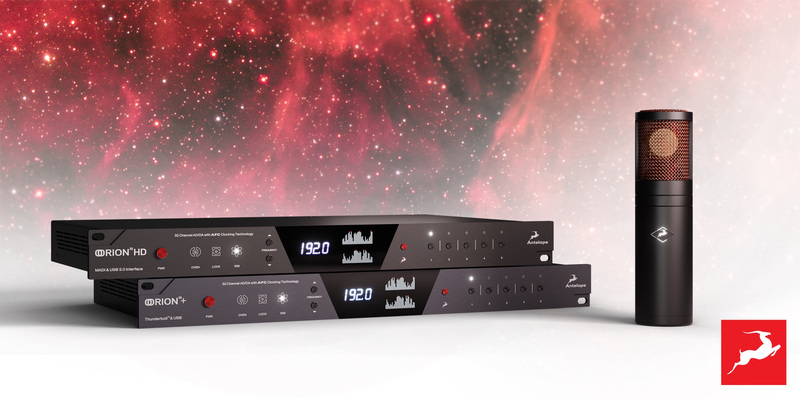 2019 sees trailblazing pro audio manufacturer Antelope Audio firing on all cylinders with the worldwide premiere of three one-of-a-kind, industry-leading products — Edge Go, the world’s first bus-powered modeling microphone (enabling a complete studio experience with circuit-level mic and gear emulations onboard Antelope Audio’s real-time FPGA FXplatform), alongside the cutting-edge Orion32+ | Gen 3 and Orion32 HD | Gen 3 flagship audio interfaces (offering unparalleled connectivity and unmatched conversion quality at expectations-defying prices) — at the 2019 NAMM Show in Southern California, January 24-27. Meet the Edge Family of modeling microphones’ newest member! Edge Go is so much more than just another USB microphone —- it’s a complete recording studio experience housed in a mic! Connected via USB-C and equipped with a 3.5mm headphone jack for real-time monitoring, Edge Go achieves an entire processed vocal chain at the hardware level — and all in real-time. With a variety of high-end condenser mic models and a special selection of lifelike vintage compressor and EQ effects, plus built-in de-essing, gating/expansion, tape saturation, and reverb all controlled by an intuitive PC/Mac app, getting fully-finished recordings on the go has never been simpler. Saying that, a collection of channel strip presets, crafted by industry pros, makes it even easier to quickly achieve a sound that’s ready for radio, podcast, Twitch stream, or album. And it all comes straight off the Edge Go, with practically imperceptible latency.